Assisted Reproductive Technologies are the treatments which include the handling of eggs and sperm and/or embryos. Some examples of ART are in vitro fertilization (IVF), gamete intrafallopian transfer (GIFT), pronuclear stage tubal transfer (PROST), tubal embryo transfer (TET), and zygote intrafallopian transfer (ZIFT). A more up to date methodology known as peritoneal oocyte and sperm exchange (PROST) is fundamentally the same as ZIFT. In any case, in PROST, eggs that are treated by sperm in a research facility dish are put into the fallopian tube before cell division happens. Low sperm count in a man. Structural problems in the uterus. Who is a Suitable Candidate for this Procedure? People who have tried IVF to become parents and failed, are the ideal candidates of PROST. Other than the given reason, the person should have a healthy weight and no addictive habits. Who Shouldn’t Opt for PROST? 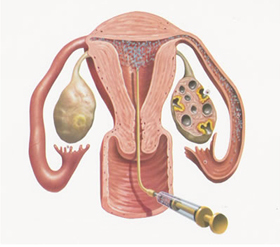 In this method, sperm and eggs are directly placed into the peritoneal cavity near the fallopian tubes, under ultrasound guidance, immediately after transvaginal ultrasound guided egg collection has been performed. PROST is mostly used as a back-up treatment for superovulation and IUI. This is done because in superovulation and IUI, some women develop too many follicles, so that the risk of multiple pregnancies is always present. In these cases, the choice is between abandoning the cycle, or shifting to a procedure like IVF or ICSI Treatment or POST. What are the Risks and Complications of PROST? PROST is successful only when the fallopian tubes are in good condition. Any structural defect tubes may result in failed attempts to get pregnant. The odds of conceiving multiple babies may increase, given the fact that a few zygotes or gametes are planted in the fallopian tube to increase pregnancy chances. The quality of embryos can't be assessed before implantation, not at all like with IVF methodology, except if TET is utilised.